This creates the very simple tree at the right. See that the root is 8, its left child is leaf node 5, and the root has no right child. Of course, a complicated tree can be hard to read, but the tree operation file also contains a printer which makes it a bit easier. Takes an integer item and a tree tree, and returns a new version of the tree with item added to it. Takes a list of integers itemlist and a tree tree, and returns a new version of the tree with each member of items added to it, in order left to right. Takes an integer item and a tree tree and returns a copy of tree with item removed. If tree does not contain item, an unchanged copy of tree is returned. If tree contains multiple copies of item, the highest one is removed. Prints the tree tree and returns null. Notice that operations which update the tree always return copies. There is no notion of updating an existing tree in place; just making a new one with changes. This is the nature of Lisp as a purely functional language. Takes an integer item and a BST tree and returns #t if tree contains item, or nil otherwise. Use the standard BST search techniques to perform no more than O(log n) comparisons in a tree of n nodes. Takes an integer item and a BST tree and returns an integer count of the number of times item occurs in tree. The existing insert method is happy to place multiple copies in a tree, so this really is different from the other method. As the previous, log n behavior is required. Return a plain Lisp list containing the items in BST tree arranged in in-order (sorted order). Hint: You will probably want to use the built-in append function in the body of your btree-list-in. Return the maximum value in the tree. If the tree is empty, return nil. Do not use more than O(log n) steps to find the maximum value. 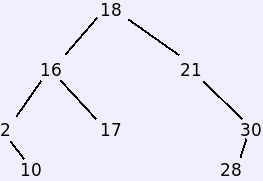 Return a copy of BST tree with its maximum element removed. If tree is empty, return the empty tree. If the maximum element appears more than once, any single copy may be removed.